Megatrends are easiest to recognize in hindsight, which leads many investors to wonder how they missed out on something so big. How many times have you thought to yourself, “I knew that business or product was going to be huge but I just didn’t do anything about it”? When I discovered the trends at work in the robotics and automation space – and then discovered that there were no current indexes available to investors – I decided to do something about it. 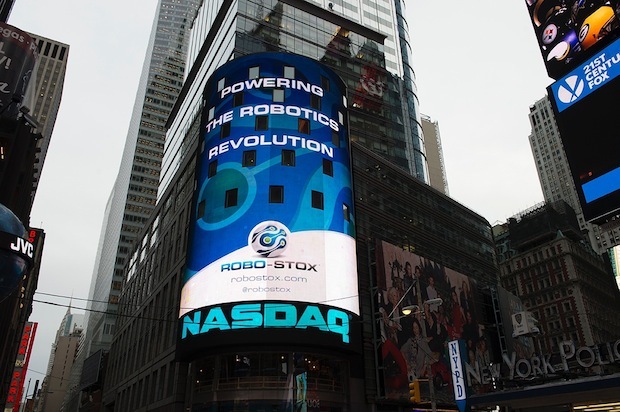 My name is Rob Wilson, CEO of ROBO-STOX™, and in 2013 we partnered with world-leading scientists and investment experts to create the first and only dedicated stock index to track the business of robotics and automation. For investors not interested in putting all of their money into a single robotics stock, the ROBO-STOX™ Global Robotics and Automation Index is now a great alternative. Our index consists of 78 different stocks all focused on the value chain of robotics and automation rather than just one company, and there is nothing else like it that is available to investors today. The index can be followed on Bloomberg under the ticker symbol “ROBO”, and since launch late-2013, we have seen large investment amounts being committed to vehicles that track the index. ROBO-STOX, the first dedicated robotics ETF, was launched in 2013. Robotics and automation technology adoption is accelerating as the core technology becomes more affordable and flexible. Major companies are investing in the field because the industry has reached an inflection point where the combination of capability and affordability intersects with commercial demand. The history of cell phones offers an instructive example. During the 1970s, 1980s and into the early 1990s cell phones were big, clunky and very expensive. Only wealthy individuals and business executives were willing to buy the technology, and what they got in return was often frustrating. Conductivity was low, and early phone models had limited capability, mostly centered on voice. But at some point near the turn of the century we hit an inflection point. The adoption rate turned geometric because the cost, quality, and capability of handsets evolved to a point where the productivity benefits of mobile communication were hugely compelling. Now consider robotics and automation. People have been automating the world for a very long time. Henry Ford’s first assembly line used a conveyer belt to transfer parts from station to station in order to build the model T, and this was a big step in early automation. The auto industry continued to lead in automation technology for many decades because their high cost structure and complicated processes created a large economy of scale that justified robotics investment. As automation suppliers tried to improve the flexibility of their offering to Ford, they began incorporating other technologies like semiconductors and software into their products. This increased the flexibility of what their assembly machines could do and other industries took notice. Eventually the automation know-how evolved to serve other sectors like aerospace, healthcare, and energy. But the products were still expensive and highly customized! What I believe is now different is that the cost and flexibility of automation products are finally at a point where it makes sense to use them in many new areas of the economy. Automated kiosks in airports to check you in are great example. Many more will follow. Commercial users almost always lead the adoption of new technologies because they evaluate decisions through a cost-benefit lens. With the case of handsets, companies recognized that more efficient communication would boost productivity and profits. The same is true today of robotics and automation for the likes of Amazon, Google, and a host of other big companies investing heavily in automation. The attention and involvement of large companies in automation, while not new, is definitely accelerating. And this is happening not just in the US, but globally. In China, large electronic manufacturers like Foxconn have committed to radically automating their production lines. And big companies investing and adopting the technology is a huge positive for the industry: not only do large companies bring deep pockets to fund R&D, but they help refine new business models that can lead to entirely new industries being created. The underlying motive of large companies is always to improve productivity, safety, and quality. Gains in all of these areas fuel growth and lead to a world where more goods and services are produced more cheaply than ever before. This is a tide that lifts all boats over time. What does all this mean for investors? While big corporate capital and investments will help increase company profits, they can also make others wealthy. Investors that had the insight and courage to invest their money in wireless companies alongside corporate America during the 1990s and early 2000s made fortunes.The goal of ROBO-STOX™ is to provide the average investor with a straight forward, diversified, and affordable way to invest alongside Wall Street in robotics and automation. A wealth of robotics, automation and index investment research reports and related-videos can be found on the ROBO-STOX™ website. Are investments in robotics capital intensive?